AMMONNEWS - His Majesty King Abdullah, Cypriot President Nicos Anastasiades, and Greek Prime Minister Alexis Tsipras agreed during their Trilateral Summit on Sunday at Al Husseiniya Palace to expand cooperation between the three countries in vital sectors including energy, agriculture, tourism, health, education, trade, investment, and ICT. The King also pointed to Cyprus’s and Greece’s support for Jordan’s efforts to safeguard Islamic and Christian holy sites in Jerusalem. "This is something that is close to all our hearts," His Majesty said, commending the important role of the Greek Orthodox Church in Jerusalem, the West Bank, and Jordan. Thanking the King for the hospitality, President Anastasiades said the meeting "reflects the importance we attach to further expanding and deepening our synergies to the benefit of our countries, our peoples in the region as a whole". "The signing of the memoranda of understanding in the field of education, and between our respective investment promotion agencies, as well as the first trilateral business forum taking place today, constitute important developments in fully exploring the important opportunities between our countries," the Cypriot president added. "I believe that the decision we have taken to establish a permanent secretariat in Cyprus will serve the further development of our trilateral mechanism, with the aim of ensuring that both its potential and momentum are fully exploited and utilised," he said. President Anastasiades said the three countries share a common belief in the need to achieve political solutions to regional crises in accordance with international law, "and in full respect of the sovereignty, territorial integrity and independence of states, as well as of good neighbourly relations". "In this respect, I wish to assure Your Majesty that we will continue working with our EU partners so that Jordan is supported both politically and economically in addressing the consequences of the refugee crisis, and the heavy burden this places on its economy, structure, and society," President Anastasiades said. "In parallel, we will continue to actively advocate for the strengthening of EU-Jordan relations, including engaging more on regional and foreign policy issues," he added. President Anastasiades also spoke about the latest efforts to resume negotiations on the Cyprus problem to reach a lasting solution. For his part, Greek Prime Minister Tsipras said the Summit "highlights the determination to strengthen our partnership with a strategic perspective for the region". "Jordan is a country with which we have strong historical and cultural ties. Jordan is a country that constitutes one of the most important forces of stability in the region as well as of peace and coexistence in our broader region," he added. Greece and Cyprus, as "frontline EU countries in the region", realise that "challenges that have to do with security or refugee flows in the Middle East are challenges for Europe as a whole," Prime Minister Tsipras added. "Your crucial role in Syria, and your crucial role in supporting Syrian people; your crucial role in the Middle East peace process, and your role as Custodian of the Islamic and Christian shrines in Jerusalem; or your role in confronting terrorist networks and extremism it is very important for global and regional developments," he said, addressing His Majesty. The prime minister said Greece will increase coordination to strengthen EU-Jordan relations and "to support peace in Syria, and a two-state solution for Israel and Palestine living in peace, based on the borders of 1967, with East Jerusalem as the capital of Palestine." Also on Sunday, the King held bilateral and expanded talks with Greek Prime Minister Tsipras, which covered opportunities for further cooperation and regional issues. 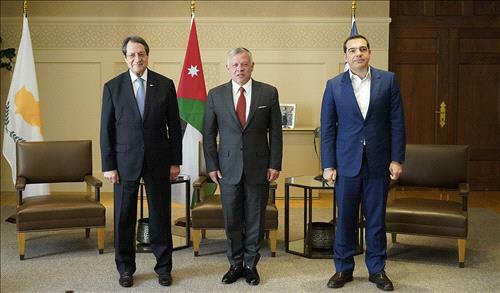 "We, Abdullah II ibn Al Hussein, the King of the Hashemite Kingdom of Jordan, Nicos Anastasiades, President of the Republic of Cyprus, and Alexis Tsipras, Prime Minister of the Hellenic Republic", having met in Amman today, 14 April 2019, have agreed to strengthen the trilateral cooperation between our countries in order to promote a partnership in various fields of common interest, and to work together towards promoting peace, stability, security and prosperity in the region, and we have agreed to build on the outcomes of our first trilateral Summit, which took place in Nicosia on 16th January 2018. We commend the holding of the first European Union - League of Arab States (LAS) Summit, which took place on the 24th and 25th of February 2019 in Egypt, and opened the door to deepen cooperation on shared strategic priorities including security threats, regional crises, climate change , migration and refugees. We welcome the signing of the trilateral "Memorandum of Understanding on Cooperation in the field of Education for 2019-2022" which will lead to the exchange of experts between our three states, and enhance our trilateral cooperation in the areas of environmental education, sustainable development and information communication technology, as well as to establish direct links and cooperation between our higher education institutions. We also welcome the signing of the trilateral "Memorandum of Understanding on Cooperation between Jordan Investment Commission (JIC), Enterprise Greece S.A. and "Invest Cyprus" aiming at strengthening investment relations and improving the business and trade environment. We believe that the large gas discoveries in the offshore fields of the eastern Mediterranean will have a major impact on the energy sector and economic development in the region and can serve as a catalyst for regional stability and prosperity. Based on such discoveries, we welcome the holding of the first meeting of Ministers of energy which took place in Cairo on January 14, 2019, where the Ministers established the "East Mediterranean Gas Forum" (EMGF), as a forum for all states in the region, to support the efforts of its members - both producers and consumers - to benefit from gas reserves and infrastructure in order to secure their energy needs. We reiterate the significance of the "Council of Europe Convention on Offences relating to Cultural Property", the "Nicosia Convention", which focuses on the criminalization of the illicit trafficking of cultural property, and we underline the importance of protecting the cultural heritage of the Eastern Mediterranean, and emphasize our resolve to counter looting and illicit trafficking in cultural property especially in armed conflict areas. Furthermore, the trilateral Agreement on the Prevention of theft, clandestine excavation and illicit import, export or transfer of ownership of cultural property and the promotion of its restitution, which was signed on 16 January 2018, bears testimony to the importance our countries attach to these issues.